During John's time on the Vicksburg Campaign with the 120th, the regiment spent time at Milliken's Bend along the Mississippi River bordering Louisiana and Mississippi. 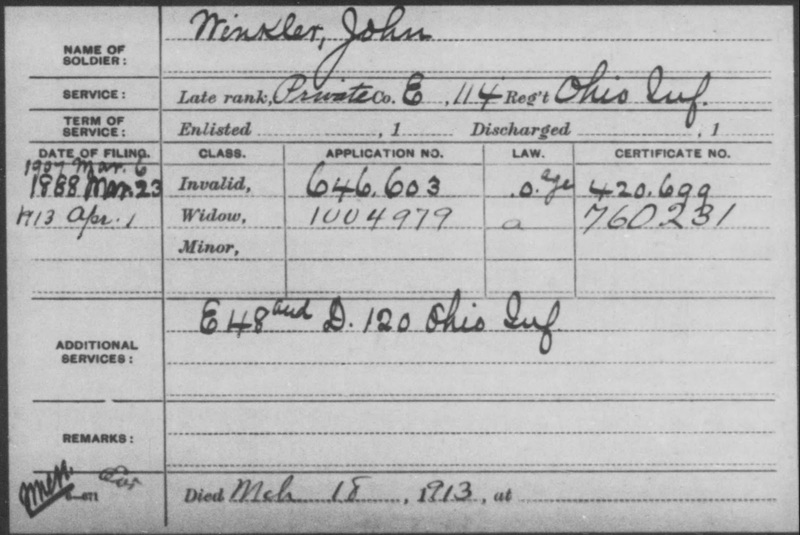 Here John personally identifies that he contracted a horrible stomach bug in 1862/63. The specific cause was never identified, but it plagued him regularly for the rest of his life. 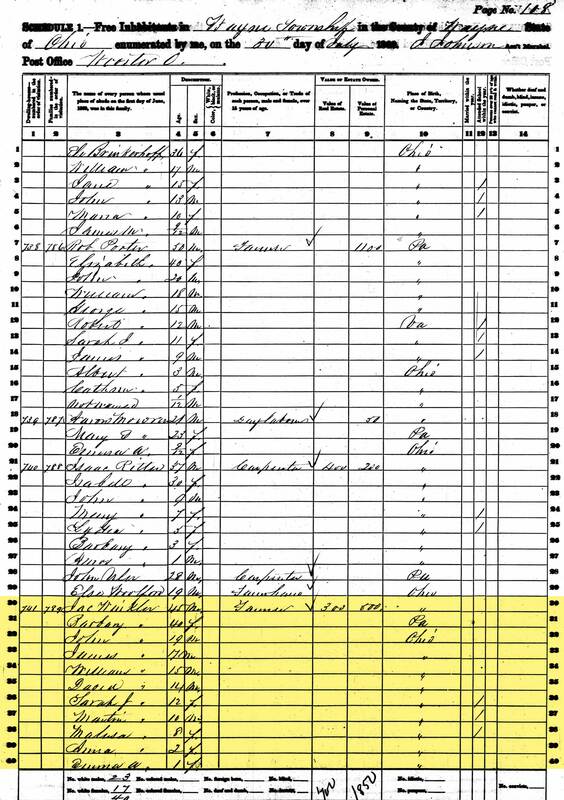 Muster rolls identify that John was taken sick and left in the hospital at Memphis, Tennessee on 20 Dec 1862. His recovery time was quick and he mustered back in January. Then again, John was left sick at Perkins Plantation, now Somerset Plantation outside Newellton, Louisiana on 30 Apr 1863 (Gen. Ulysses S Grant commanded the Union Army from this plantation during the Vicksburg Campaign; 25 miles separate Milliken's Bend and Somerset Plantation as they encircle Vicksburg from the north and south). This was only temporary as by the end of May he had mustered back in with his regiment. 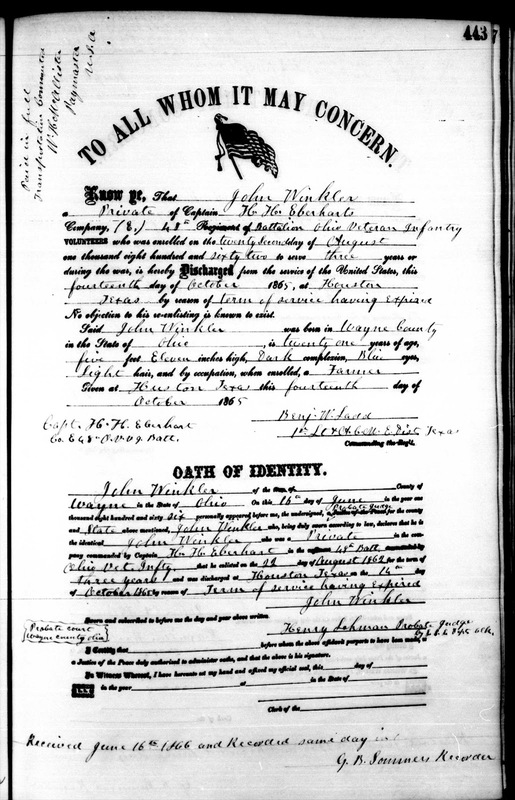 Civil War Discharge PapersOn 27 Nov 1864, after mustering out of the 120th, John was transferred to Company E 114th Ohio Volunteer Infantry.5 Here in the 114th regiment, the last years’ of his service were devoted to various detached expeditions, guard duty, etc. 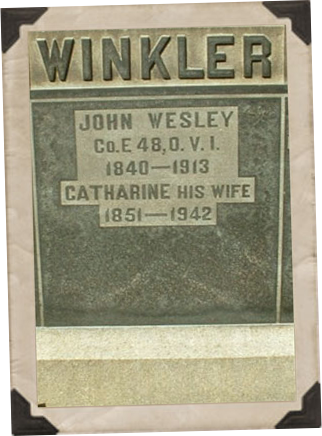 At the age of 29, John Wesley Winkler married Catharine Ann Warner on 06 Jan 1870 at her parent's home in Chester Township, Wayne County, Ohio10, 11 (John's father and Catharine's father owned land adjacent to one another making John and Catharine neighbors. )12, B, E The ceremony was conducted by Rev. P.J. Brown of Congress, Ohio. 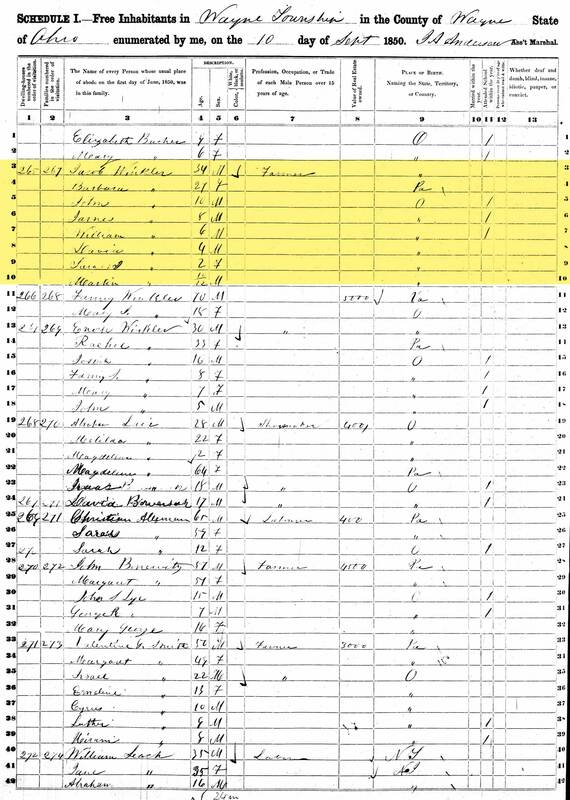 The 1880 Agricultural census gives us a good look at what was going on at John's farm through the previous year. He states he owns 27 acres of farmland in Chester Township valued at $3,000. 21 of those acres are tilled, 2 are permanent orchards and 4 acres are woodland. Of the 21 tilled acres, 5 acres are mown accounting for 8 tons of hay and 2 bushels of clover seed. He owns 3 horses, 4 milk cows and 4 calves. 1 cow was sold, another was sent to slaughter and in total produced 400 lbs of butter. 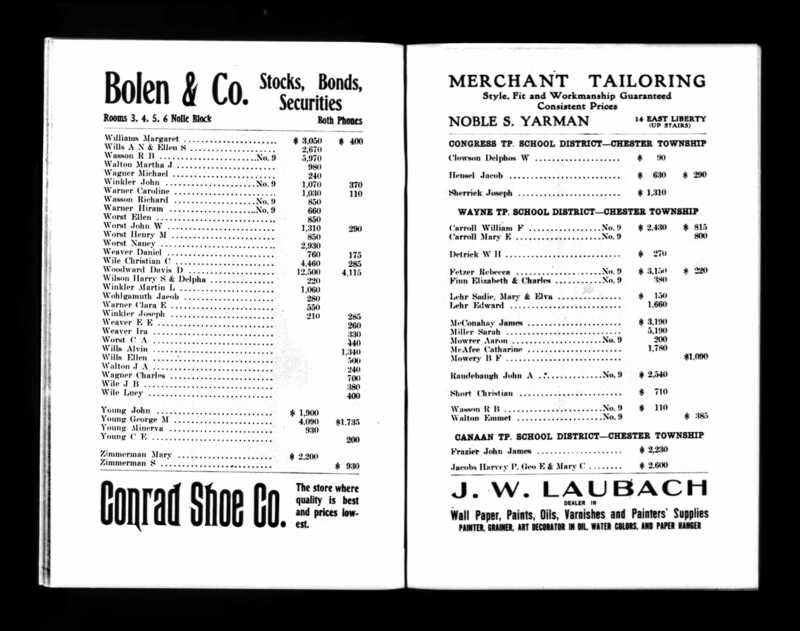 He also owned 12 pigs, 50 chickens and 4 other poultry producing 300 dozen eggs. 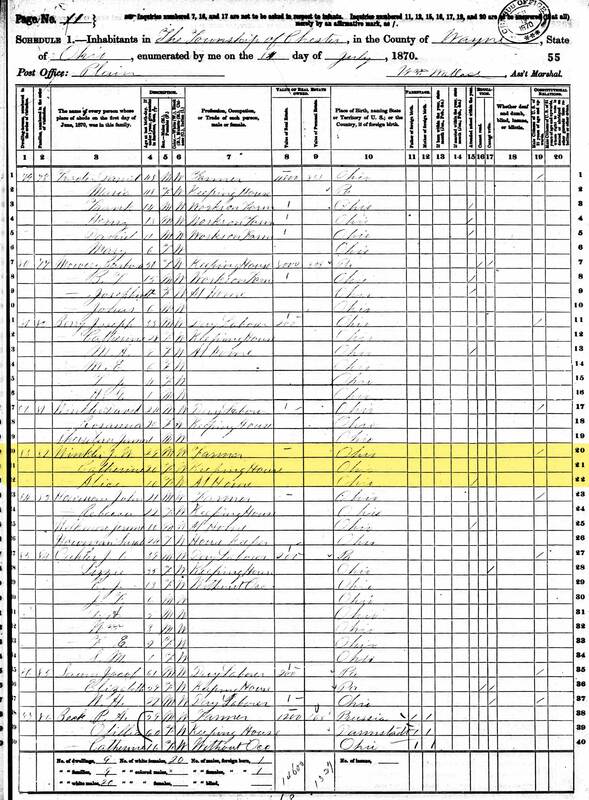 He grew 500 bushels of Indian corn on 13 acres, 175 bushels of oats on 5 acres, 10 bushels of rye on 1 acre, 400 bushels of wheat on 20 acres and 40 bushels of Irish potatoes on a quarter acre. His farm also had 80 apple trees on 2 acres, 20 peach trees and kept honey bees that produced 40 lbs of honey the previous year. 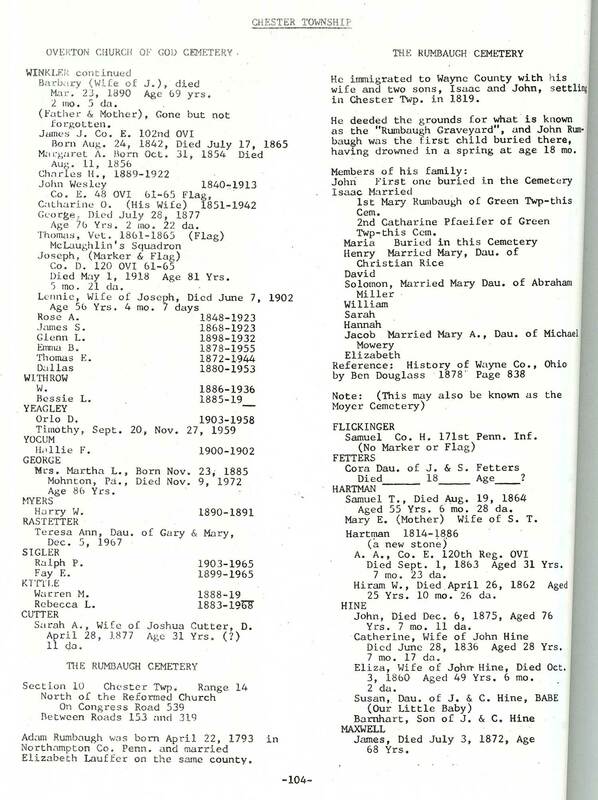 Death Notice (1913)After John's father Jacob passed away in 1890, John's brother Martin took over the property on Winkler Rd. and brother William would own the rest property which bordered Overton Church to the east. 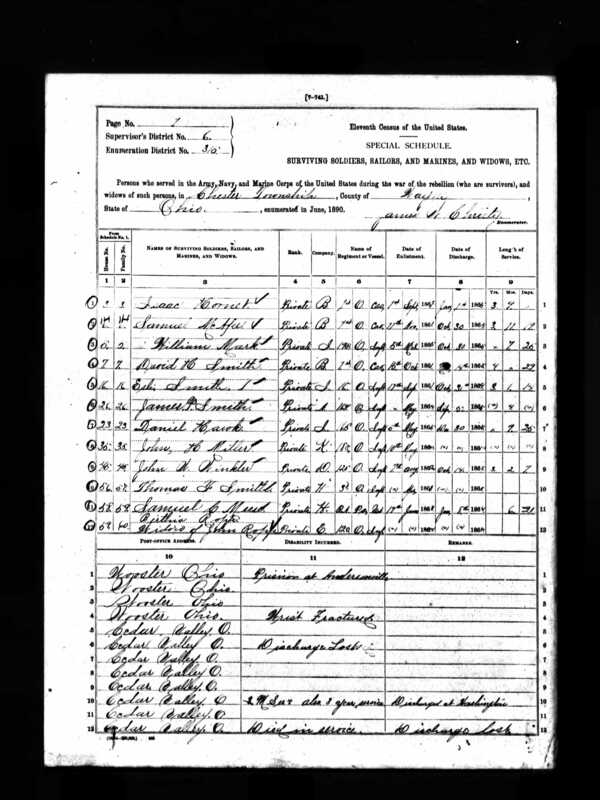 By 1910, John was medically re-evaluated for a pension increase and his condition was not good. It hadn't been for years (which is alluded to in his death notice in the paper). Now approaching 70, John's light colored hair has now gone white, his complexion, which was dark against his blue eyes in his youth has now gone pale. He's anemic and emaciated; only weighing 142 lbs. What used to be a 5' 11" frame is now reduced to under 5' 8". He walks with an "uncertain and wobbly" gait and his stomach condition has become completely disabling while attacks are occurring almost weekly, limiting his food consumption to the good days. 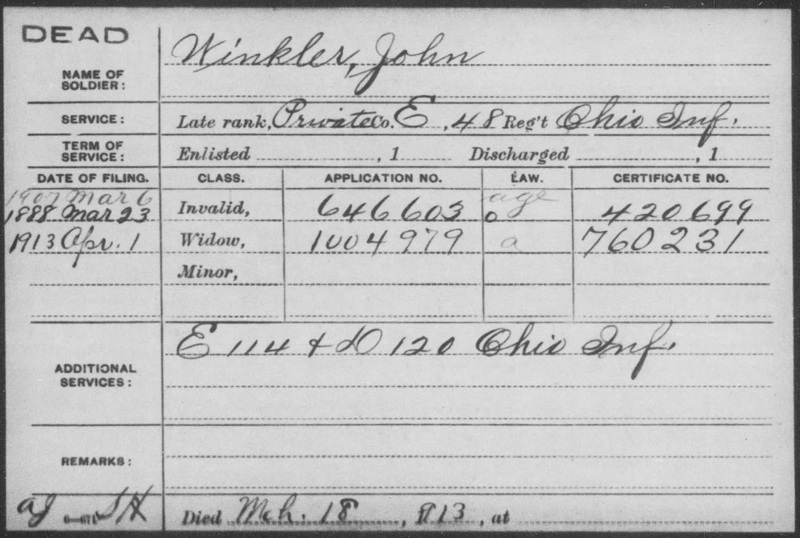 A John Wesley served on the 120th OVI along with his cousins Joseph H Winkler and George Madison Winkler, both of whom were sons of Uncle George Winkler. Both cousins survived the war. B I cannot say for certain, but I believe that John Wesley spent a short amount of time living with his father and family at Jacob's home on Winkler Road in Overton before he acquired his own property down the road with wife Catharine. 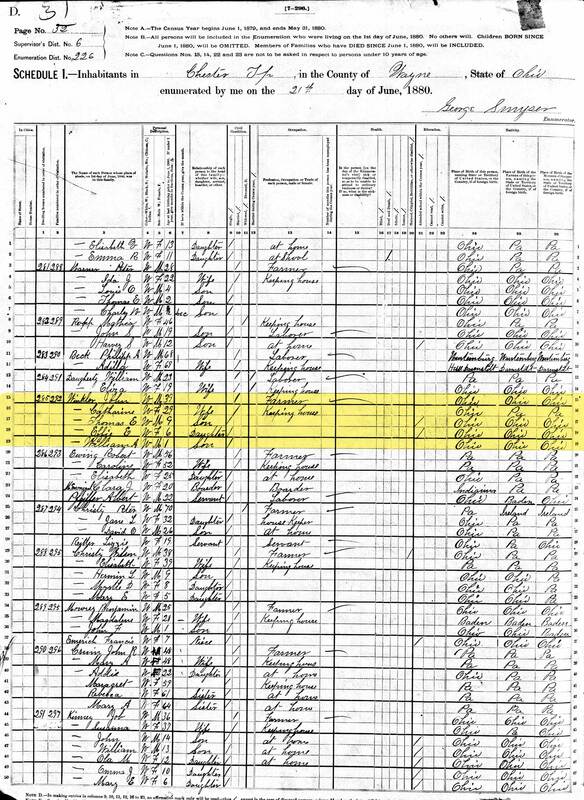 Even though we have no records to make this distinction, it makes sense that John would have moved into the area with his father and met Catharine Warner, who lived nearby, prior to marrying and moving almost next door to his parents. C John was born in the Mechanicsburg area of Wayne Township. 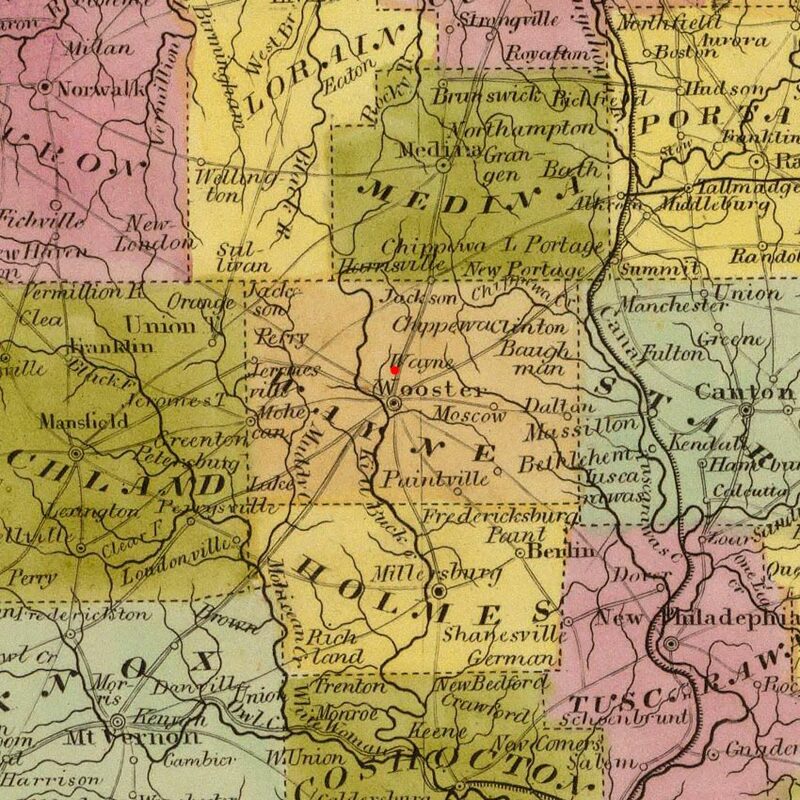 After marriage moved to Chester Township on Overton Rd near Overton Church and after his father-in-law Thomas Warner passed away, he sold his property and moved into Thomas' home just south of them, still in Chester. 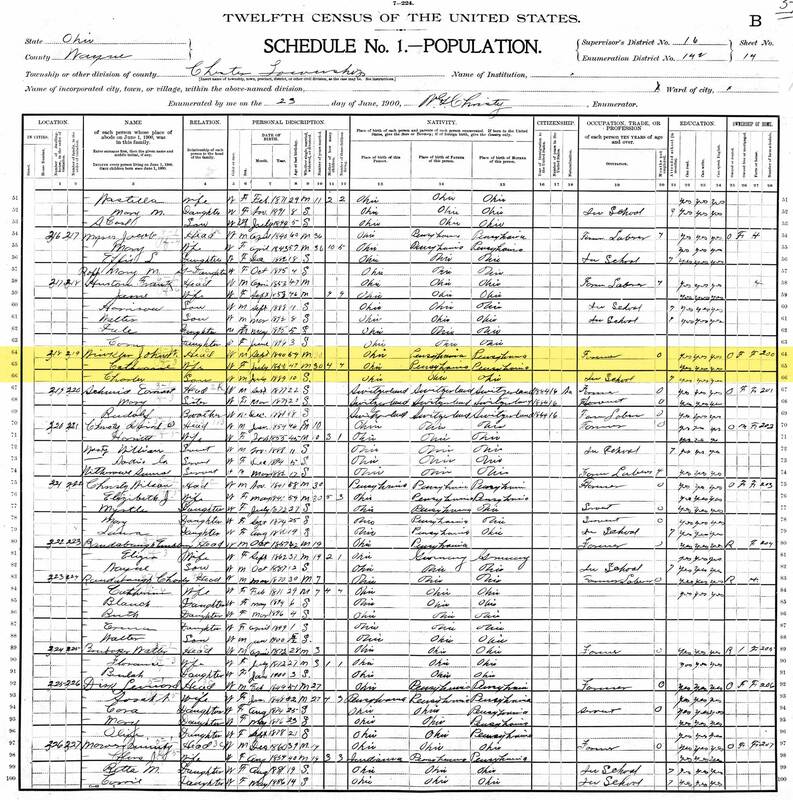 When John's father died 11 years later, brother Martin got the house and property on Winkler Road and William got the land east of Overton Church. D Inflation estimations are tricky, but this amounts to roughly $300 a month today. E John and Catharine didn't grow up next to each other. 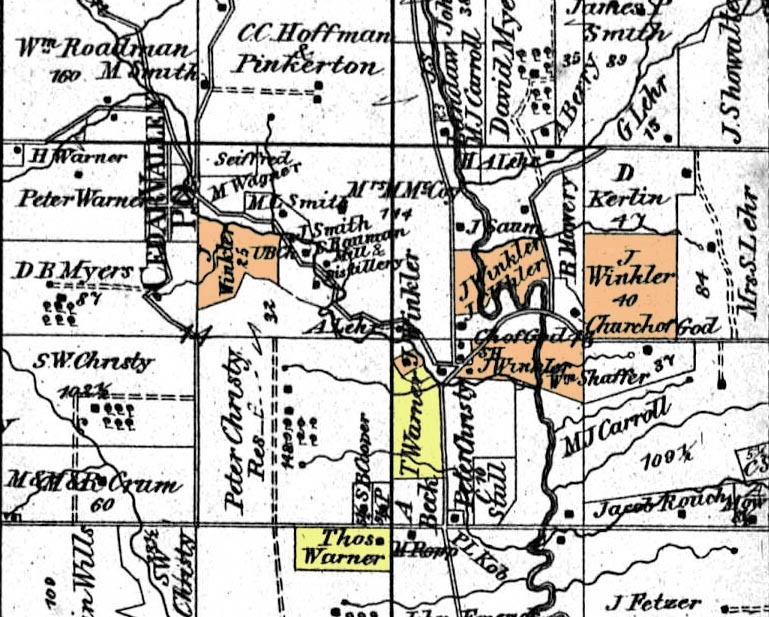 Somewhere around the time John went off to fight in the Civil War, father Jacob sold the family farm John grew up on in Wayne Township and relocated to the Overton/Cedar Valley area of Chester Township. So it's safe to say that John & Catherine weren't introduced or at least didn't get to know each other well until after John returned from his service in the Civil War. Can property transactions at the Wooster Library narrow down a time for the Winkler family's relocation to Chester Township? ...and confirm it's before John's marriage? 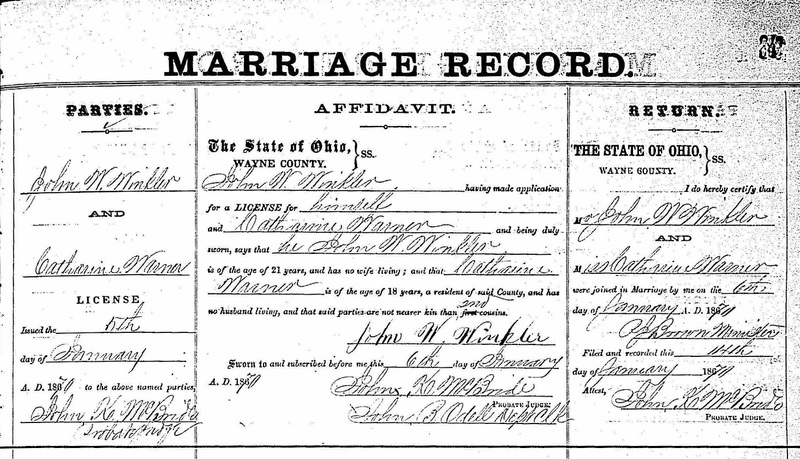 10 John W. Winkler, "Ohio, County Marriages, 1789-1994"; "Ohio, County Marriages, 1789-1994," index and images, FamilySearch (https://familysearch.org/pal:/MM9.1.1/XZ8T-4ZZ : accessed 07 Feb 2014), John W. Winkler and Catharine Warner, 06 Jan 1870; citing Wayne, Ohio, United States, reference vol 7 p 348; FHL microfilm 425756. 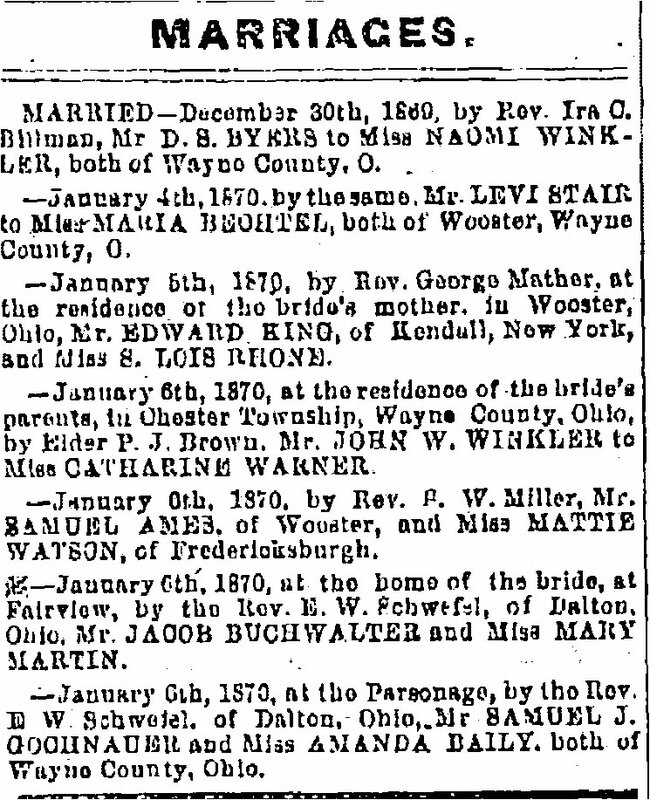 11 Marriage Announcement for John W. Winkler and Catharine Warner; The Wooster Republican Newspaper; Monday, 13 January 1870; page 3. 12 U.S., Indexed County Land Ownership Maps, 1860-1918 about J Winkler; Collection Number: G&M_38; Roll Number: 38; County Land Ownership Atlases. Microfilmed by the Library of Congress, Washington, D.C.; 1873. 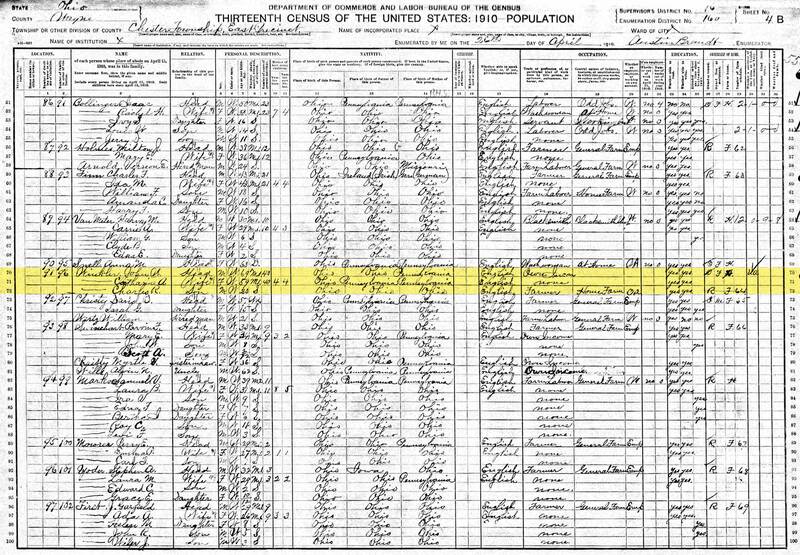 13 1870 United States Federal Census about J W Winkler; Year: 1870; Census Place: Chester, Wayne, Ohio; Roll: M593_1280; Page: 55A; Image: 114; Family History Library Film: 552779. 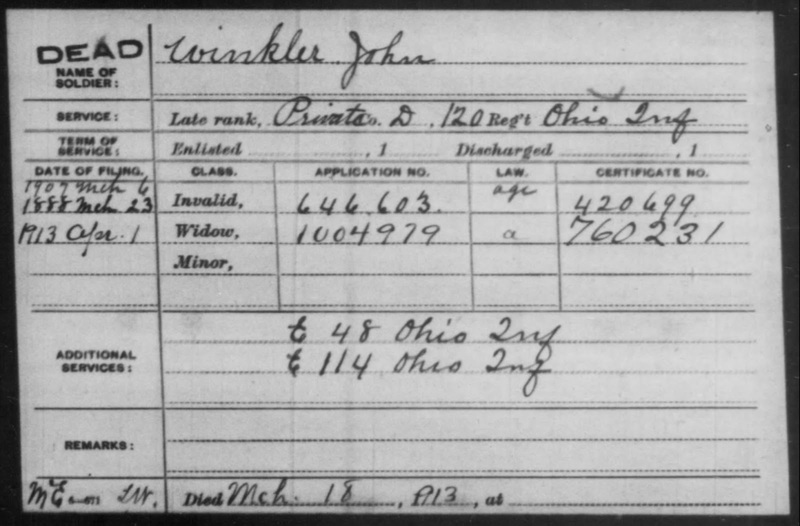 14 1880 United States Federal Census about John Winkler; Year: 1880; Census Place: Chester, Wayne, Ohio; Roll: 1076; Family History Film: 1255076; Page: 64D; Enumeration District: 226; Image: 0657. 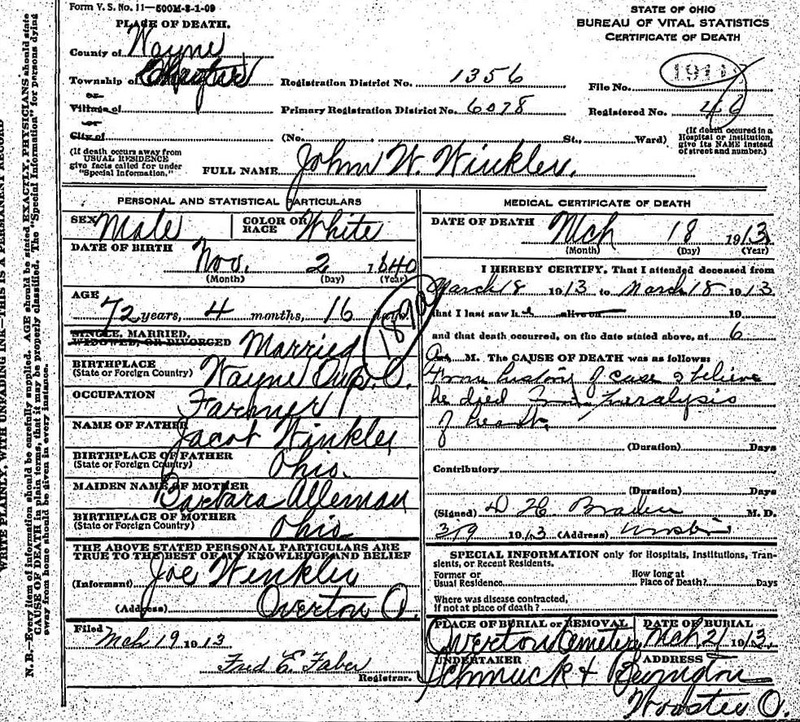 15 Civil War Pensions for John Winkler; Wayne County Public Library, Wooster Branch; Genealogy Department; Civil War - 1890's Pensions; (http://wcpl.info/LibraryConnection/Genealogy/OnlineMaterials/Pensions1890s.aspx); Visited: 07 Feb 2014; John Winkler - 22 Nov 1899. 16 U.S., Indexed County Land Ownership Maps, 1860-1918 about J Winkler; Collection Number: G&M_38; Roll Number: 38; County Land Ownership Atlases. Microfilmed by the Library of Congress, Washington, D.C.; 1908. 17 Obituary of John Wesley Winkler; The Wooster Daily Record Newspaper; Tuesday, 18 Mar 1913; Sudden Death of John Winkler; Page 1. 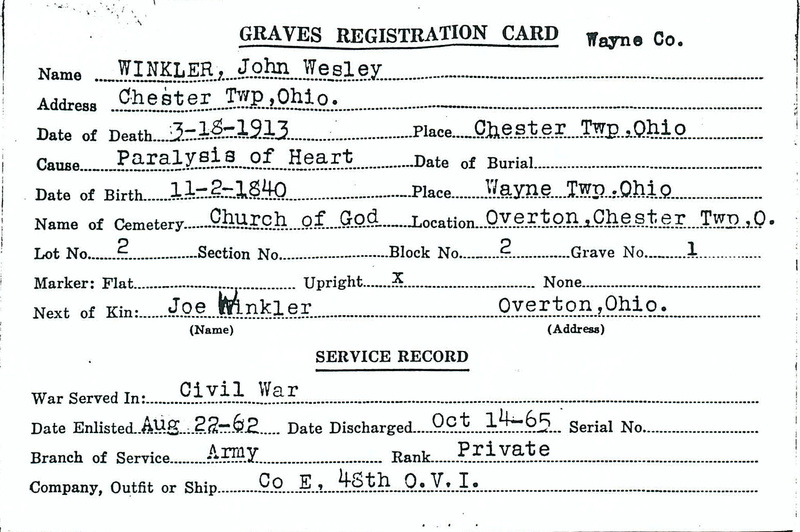 18 Wayne County, Ohio Burial Records about John Wesley Winkler; Wooster Branch of Wayne County Public Library; Wayne County, Ohio; Chester Township; Overton Church Of God Cemetery; pg. 104.